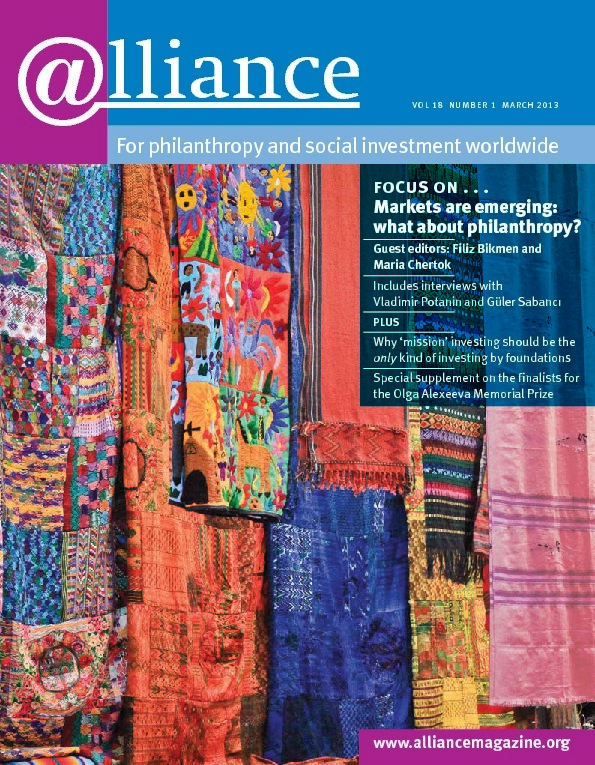 I read Caroline Hartnell’s editorial in the December issue of Alliance with the utmost interest, as well as Geoffrey West, Buzz Holling and Neal Hegarty’s contributions on the theme of funding for innovation. ‘Does the trend towards impact-driven funding mean that foundations are less willing to support experimentation and innovation?’ I don’t want to be too provocative, but I would like to put a series of questions and eventually provide some tentative answers. Foundations like to say that their strategies are innovation-oriented, but how much and how effectively do they support creativity internally? How many foundations actually seek more innovative paths and how do they explore and develop them? How do foundations promote a systematic search for new solutions? I feel that we are still at the very beginning of a long process. Grantees are constantly encouraged to be creative and innovative, but paradoxically grantmakers are not always in the forefront themselves. In the last years, foundations have been stressing the need to measure the impact and the efficacy of their grants. This is totally understandable, considering the global economic crisis and the subsequent decrease in available funds. Nevertheless, what progress has actually been made in impact evaluation? How many foundations effectively measure the impact of their programmes? Again, my impression is that this trend is still an embryonic one and that resistance to change and to impact measurement is widespread. Should we perhaps look at the problem from an opposite direction? That is, is it possible that the real issue or danger is the shortage of organizational strategies for innovation at foundations as well as limited ability to measure scientifically their philanthropic programmes? I personally don’t believe there is an irreconcilable contradiction between scientific impact measurement and the search for innovation. Shouldn’t scientific rigour in measurement and impact orientation serve as a springboard to innovation? But how? Premising that a foundation’s philanthropic portfolio should include a balanced mix of innovative-breakthrough programmes and more conventional ones, foundations should perhaps – and this is only a tentative answer to our initial question – pay greater attention to the creation of a new philanthropic mentality (starting from their own boards) and listen to their grantees’ ideas at an earlier stage, thus already fostering the search for innovative solutions with measurable impact at the project design phase.